Peripheries is an ongoing body of photographic work that attempts to capture what lies beyond the edge of human vision. The camera, an optical device that uses a single vantage point and a single lens to view and document the world often produces imagery that is mistaken for reality. Human vision relies on the blended optics of both eyes to produce images in the brain, and is often prone to inaccuracy. I am interested in the fluid nature of photography and the fictitious narratives the medium is able to produce. Mimicking the sensation of experiencing a moment through peripheral vision, I aim to produce a body of work that can evoke a memory from mental imagery that lies on the cusp of clear vision. 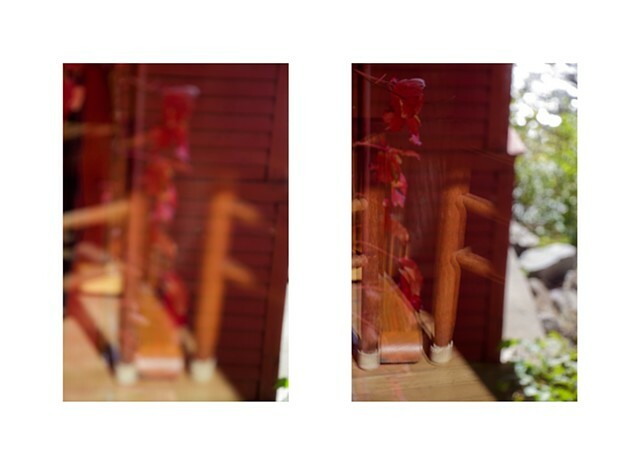 In Peripheries, attention to light and shadow, long exposure times, and soft focus images are paired together in a stereoscopic composition; mimicking human vision. The image pairings seem similar, yet slightly different; suggesting that the photographs were taken just moments from one another. Details are lost, and the viewer is left with a subtle sensation of a moment rather than an illustrative interpretation of a landscape, a person, a room, a colour, a shape, or light. In this sense, the suggested experiences evoked in Peripheries awaken memory in the viewer, while their interaction with each pair of images depend largely on their own memory banks and past experiences that they bring to each image.